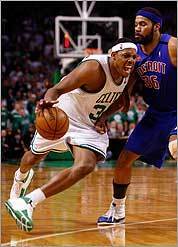 DURING THE 2008 playoffs, the Boston Celtics have been nearly unbeatable, at least when playing at home. Until Thursday, when they lost to the Detroit Pistons, the Celtics were a perfect 9-0 at home, with an average margin of victory of more than 16 points. They look, in short, like champions. However, when the Celtics leave the TD Banknorth Garden something mysterious happens. Their defense crumbles, their shooting percentage plummets, and they look woefully out of sync. As a result, the team has lost playoff game after playoff game. If it weren't for their home-court heroics, the team would have been sent packing weeks ago. The Celtics are an extreme example of a sporting phenomenon known as home-field advantage: teams playing on their home field, or court, are significantly more likely to win. The advantage plays a role in every major sport. Home teams in the NBA have a 62 percent chance of winning, while those in Major League Baseball and the National Hockey League have a 53 percent chance of winning. (Football teams are somewhere in between, with annual ranges typically between 54 and 64 percent.) Although the effect has declined over time - in 1950, home teams in the NBA won 75 percent of all games - playing at home remains one of the most significant advantages in professional sports. "Athletes spend so much time and energy looking for any kind of edge," says Albert Carron, a professor of kinesiology at the University of Western Ontario. "But nobody's found another edge this powerful." Despite the magnitude of the effect, though, the source of the home-field advantage remains shrouded in mystery. Even athletes don't seem to understand the phenomenon. When Ray Allen was recently asked why the Celtics couldn't win away from Boston, he confessed that he had no clue: "It's hard to say. I have no answer for it. I have no answer." Scientists, however, have begun to find clues. In research that has focused on sports as varied as cricket, figure skating, and field hockey, they have discovered that the home-field advantage is a surprisingly complex phenomenon that likely includes the influence of fans on player performance, the bias of referees, and the optimal emotional state for athletes. So, while there is no definitive explanation for home-field advantage - Ray Allen was right - researchers suggest that there are some prime suspects. Perhaps the most obvious one is the disadvantage of having to travel, which can be tiring, frustrating, and disorienting. One study of collegiate basketball teams found that even when a visiting team had traveled less than 200 miles, the home team had a winning percentage of 58.8 percent. When the journey had been more than 200 miles, the home advantage increased to 84.6 percent. For these amateur athletes, traveling longer distances, often by bus, was a serious handicap. Professional teams, however, seem to be better adjusted to life on the road. (The chartered planes and fancy hotels probably help.) A 1986 analysis of nearly 3,500 Premier League English professional soccer games found that the distance traveled had no effect on home-field advantage. A study in 1992 of professional baseball and hockey teams concluded that "travel factors" accounted for less than 1.5 percent of the variance in the home advantage. A notable exception is when teams travel from the Pacific time zone to the East Coast. In this situation, jet lag seems to impair performance. For instance, a 1995 study of MLB teams found that teams crossing the country scored, on average, 1.24 fewer runs than expected. Another theory is that the home-field advantage comes from a familiarity with the field itself. When the 1985-86 Celtics went 40-1 at home, several competitors complained that the old Boston Garden, with its slightly uneven parquet floor, gave the team an unfair advantage, since the Celtics were more familiar with the "dead spots." Likewise, the odd proportions of Fenway Park are often cited as an asset for Red Sox hitters, since they're used to the stadium's unusual layout. They know how to hit the ball over the Green Monster, and the team's fielders are comfortable with the park's odd angles. There's some evidence that the unique quirks of a sporting venue do help the home team. For example, a 1995 study showed that British soccer teams playing on "nontraditional pitches" - fields that are either longer or shorter than normal, or consist of artificial turf - enjoyed a larger than normal home-field advantage. Another study compared the home winning percentages of NBA, NHL, and MLB teams before and after they moved to a new stadium. For 26 of the 37 teams, there was a decrease in the home advantage following a move. Because the new venue was unfamiliar - the players had yet to learn the secrets of the parquet floor - they were less likely to win. A third possibility is that the cheering crowd exerts an influence on the referees, causing them to favor the home team. A 2002 experiment showed professional soccer referees a videotaped match and had them make officiating decisions. Half of the referees watched the game without sound, while the other half were exposed to simulated crowd noise. These cheers significantly biased the calls of the referees: On average, they called 2.3 fewer fouls against the home team when listening to the sound of the crowd. Studies of actual soccer matches in the English Premier League support the experiment. (The English leagues are a popular subject for researchers because the matches feature animated audiences and take place within the same time zone, reducing the complicating factor of travel fatigue.) A 2007 analysis of more than 5,000 soccer matches found that, on average, home teams scored 1.5 goals while away teams scored 1.1 goals. This difference increased with crowd size, so that each additional 10,000 spectators increased the home-team advantage by 0.1 goals. The most surprising element of the research, however, was that the scoring disparity was largely the result of referees, with less experienced referees calling significantly more penalties against the visiting team. They seemed intimidated by the rowdy fans. A study of the Winter Olympics found that, although host countries enjoyed a large advantage - they collected significantly more medals than normal - this edge was limited to "subjectively judged events," such as freestyle skiing and figure skating. (There was no host-country advantage in timed events.) This suggests that cheering crowds influenced the verdicts of the judges, not the performance of the athletes. Some researchers, however, caution that it's difficult to tease apart referee bias from player performance. "It's possible that visiting teams actually commit more fouls or perform at a lower level," says Carron. If that's the case, then the "bias" is actually evidence of referee impartiality. When Carron investigated the number of penalties called in error during 42 televised NHL games, he found no difference between home and away teams. The cheering crowd had no effect on officiating mistakes. One of the most important causes of the home-field advantage is also the hardest to measure: the psychological state of the athletes. For one thing, most professionals aren't interested in taking a lengthy survey before a big match. And then there's the difficulty of quantifying minor shifts in mood. Nevertheless, several studies have found significant differences, at least in team sports, between the emotional states of home and away teams. (Athletes competing in individual sports, like alpine skiing and tennis, don't seem to be affected by their location.) For instance, a study of 100 rugby players found that athletes playing at home were more confident and less anxious than players on the visiting team. Similar results have been found in studies of high school basketball teams and field hockey players. This echoes what many athletes say. What remains unclear, however, is how these emotional states impact player performance. One possibility is that playing at home makes teams more aggressive. A large analysis of NHL matches found that, when home teams win, they tend to rack up more penalties for aggressive behavior, such as fighting and forechecking. Another possibility is that supportive fans help teams cope with adversity and abrupt shifts in momentum. "One of the reasons visiting teams always want to take the crowd out of the game," Carron says, "is that a crowd can really help a team get back on its feet." While a cheering audience won't always cause a team to play better - aggressiveness is not always the best strategy - it can keep a team from giving up. However, the psychological benefits provided by a home crowd also come with some important drawbacks. Even athletes playing before adoring fans report increased levels of anxiety. This can make athletes "choke" in high-pressure situations. Skills that they typically take for granted - like shooting free throws or throwing strikes - become all but impossible. Several years ago, an innovative study compared the performance of two NCAA basketball teams in the presence and absence of spectators. Because of a measles outbreak, the teams played 11 games while the schools were quarantined: the matchups took place in empty arenas. To the surprise of the researchers, both of the teams played much better without fans. They scored more points, had higher shooting percentages, and made more free throws. The cheers of adoring fans, it appears, actually hurt the home team. They just hurt the visitors even more.